Red2120's Club Penguin Cheats, Secrets, And Give Aways! 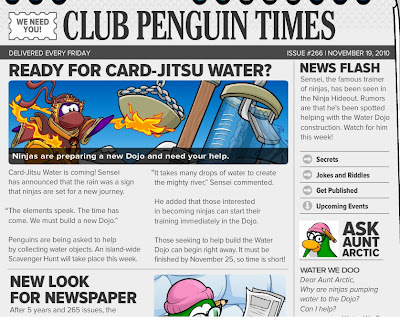 : NEW Clubpenguin Times Style! Hello everyone! Today Club Penguin released a new style of the Club Penguin Times. This is issue number 266! This new look will for sure will take time to get use to. I like this news paper because everything I like to look at is on the first page! But I don't like how there is not much pictures on the new news paper! Because living in Club Penguin we like to see amazing pictures the Club Penguin team has created for the awesome website! What do you think?